In recognition of its Georgia O’Keeffe: Abstraction exhibition, The Phillips Collection recently honored six women for their leadership in advancing the arts. See who they are here. Hint: One of them became a game-changer for me last year. 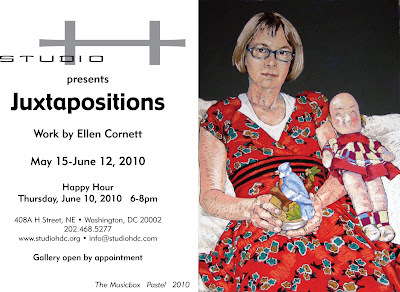 With around 100 or so folks at the opening and more than half the work already sold, Ellen Cornett's Juxtapositions at Studio His already a hit show. There will be a happy hour event on June 10; go check out this show! Wanna a real good deal on an original drawing? Not from me, but from whoever is selling this original drawing on Craigslist for only $45! "A Woman from another World"
by F. Lennox Campello (c. 2006) 24.5" x 11.5"
The price three years ago was $400. Buy it quickly! So far I've scanned about 20 of the 80 or so CDs that I've received (about 20 artists still missing) for my 100 DC Area Artists book project, coming to all bookstores in the Spring of 2011 from Schiffer Publishing. And so far I've found one particularly evil virus which was a Trojan buried in her Word software and which was auto dialing the artist's C drive contents and probably sending it to a destination in either a particularly large East Asian nation or to an even larger Asian nation. Artist notified and properly horrified. She then bought a virus software package, scanned her computer and cleaned it and promptly delivered a new CD.